THE United States is "locked and loaded" to strike despot Bashar al-Assad again if he repeats use of poison gas, UN ambassador Nikki Haley has said. Russia and the US dramatically faced off in a UN Security Council session, hours after US, French and British forces launched missiles at Assad's chemical weapons stockpile. "Last night we successfully hit the heart of Syria's chemical weapon enterprise. And because of these actions we are confident we have crippled Syria's chemical weapon program," Ms Haley said, warning Assad to think twice before unleashing chemical weapons against his people again. "We are prepared to sustain this pressure if the Syrian regime is foolish enough to test our will." A rebel-held stronghold near the town of Douma was hit with chemical weapons last weekend, killing scores of men, women and children, according to first responders and international observers. Russia's ambassador to the UN, Vasily Nebenzya, insisted there's no proof of the chemical attack and decried the allied raid on Syria. 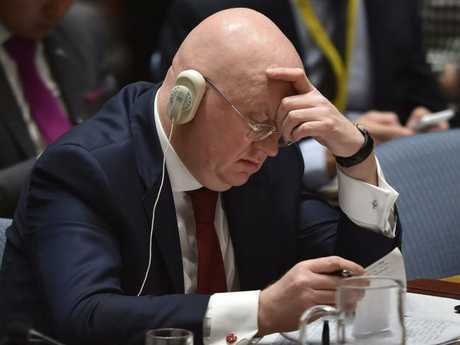 "Through its actions, the United States makes an already catastrophic humanitarian situation even worse and brings suffering to civilians," Mr Nebenzya said. Ms Haley scoffed at Russia's defence of Assad. "We can all see that a Russian disinformation campaign is in full force this morning," she said. "But Russia's desperate attempts at deflection cannot change the facts - a large body of information indicates that the Syrian regime used chemical weapons on Douma." Ms Haley, who has at times taken a tougher stance on Syria and Russia than her own White House, said Mr Trump has drawn a red line that Damascus and Moscow shouldn't cross. "I spoke to the president this morning and he said if the Syrian regime uses this poisonous gas again, the United States is locked and loaded," she said. "When our president draws a red line, our president enforces the red line." The UN Security Council rejected a Russian resolution calling for condemnation of the "aggression" by the US and its allies against Syria. The vote reflected support for the airstrikes on Syrian chemical sites but it also demonstrated again the paralysis of the UN's most powerful body in dealing with the Syria conflict. By contrast, eight countries voted against the Russian draft - the US, Britain, France, Netherlands, Sweden, Kuwait, Poland and Ivory Coast. Four countries abstained - Ethiopia, Kazakhstan, Equatorial Guinea and Peru. Meanwhile, Mr Trump labelled the strikes a victory on Twitter. "A perfectly executed strike last night," he tweeted. 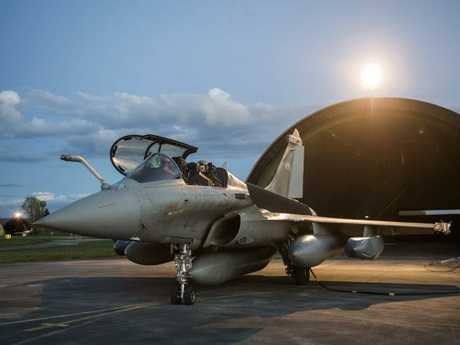 "Thank you to France and the United Kingdom for their wisdom and the power of their fine Military. Could not have had a better result. Mission Accomplished!. "So proud of our great Military which will soon be, after the spending of billions of fully approved dollars, the finest that our Country has ever had. There won't be anything, or anyone, even close!" 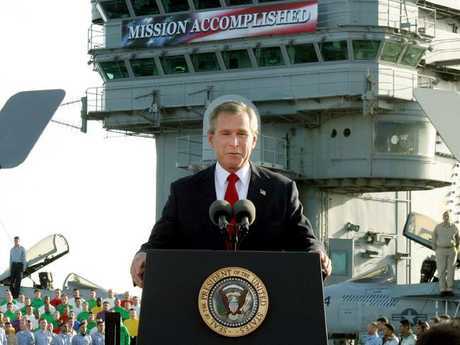 In May 2003, President George W. Bush stood on an aircraft carrier under a giant "Mission Accomplished" banner and declared that "major combat operations in Iraq have ended" - just six weeks after the invasion. But the war dragged on for many years after that and the banner became a symbol of US misjudgements and mistakes in the long and costly conflict. Bush was heavily criticised for the move. The United States, Britain and France yesterday launched a "precision strike" on three chemical weapons facilities in Syria in retaliation for a poison gas massacre that killed dozens of civilians. Mr Trump announced the action at the White House on Friday night (Washington time) in response to the Syrian regime's attack last week that killed at least 43 civilians and injured hundreds more. As Syria and Russia downplayed the impact of the strikes, Syrian state TV showed images of small groups of regime supporters in the streets of Damascus, waving Syrian, Iranian and Russian flags. A Pentagon briefing early Saturday local time revealed more detail on the strikes, describing them as "precise, overwhelming and effective". "The three facilities are or more appropriately now, were, fundamental components of the regime's chemical weapons warfare infrastructure," said Lt Gen Kenneth McKenzie, director of the Joint Chiefs of Staff. They were identified as the Barzah research and development centre, the Him Shinsar chemical weapons storage site and a chemical weapons bunker about 7km away, also in Him Shinsar. "Initial indications are that we accomplished our military objectives without material influence from Syria," Gen McKenzie said. "I would use three words to describe this operation: precise, overwhelming and effective. Dana White, chief Pentagon spokeswoman, described the operation as "carefully orchestrated and methodically planned to minimise potential collateral damage". "We hit every target," she said. The US again said the strike was not a change in strategy and its main goal in Syria remains defeating ISIS but that the world could not stand by and allow "such grievous violations of international law" as Assad's chemical attacks. "We will not stand by passively while Assad, backed by Russia and Iran, ignores international law," she said. "They have abandoned their commitments to the international comminute and resorted to illegal tactics against the innocent Syrian people. "We call upon Russia to honour its commitment to insure the Assad regime dismantles its chemical weapons program and never uses chemical weapons again." 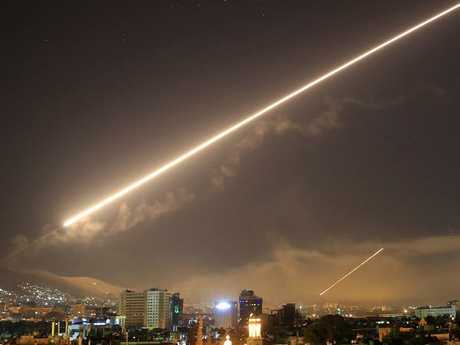 The allies used 76 missiles in the attack on Barzah, which is in the greater Damascus area. Fifty seven of these were Tomahawk cruise missiles and 19 were joint air to surface stand-off missiles. "Initial assessments are that this target was destroyed. This is going to set back the Syrian chemical weapons program back for years," said Gen McKenzie. He added the strike also destroyed three buildings in Damascus. The Him Shinshar storage facility, west of Homs, was hit by 22 weapons, including nine US tea lamps, eight storm shadow missiles, three naval cruise missile and two French SCALP land attack missiles. "This attack was coordinated by all coalition forces, our Tomahawks, the British storm shadow and the French missiles as well," Gen McKenzie said. The third target, the bunker, was hit by seven SCALP missiles and destroyed. 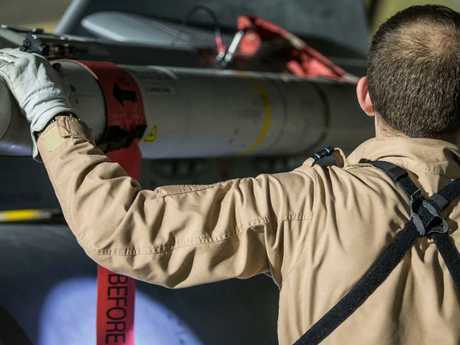 The missiles were delivered from British, French and US air and naval platforms in the Red Sea, the northern Arabian Gulf and the Eastern Mediterranean. 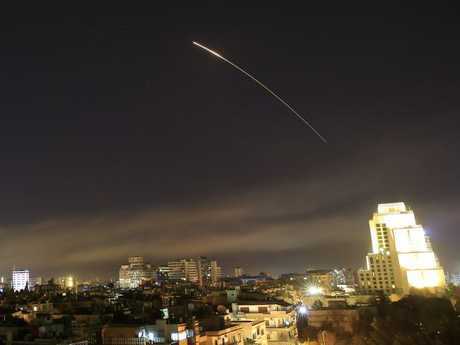 In total, the allies deployed 105 weapons against the three targets and were met by little resistance from Syria, which launched about 40 surface-to-air intercept missiles, but not until the strike was nearly over. General McKenzie said there were no indications of civilian casualties from the allied strike, although the mainly ballistic, Syrian counter-attack missiles had "landed somewhere", and the damage was being assessed. 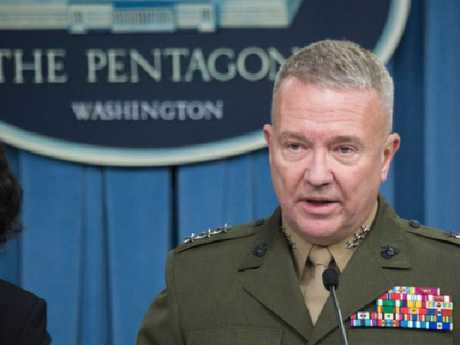 "None of our aircraft or missiles involved in this operation were successfully engaged by Syrian air defences, and we have no indication that Russian air defence systems were employed," Gen McKenzie said. "We are confident that all our missiles reached their targets. At the end of our strike mission, all our aircraft safely returned to their bases." 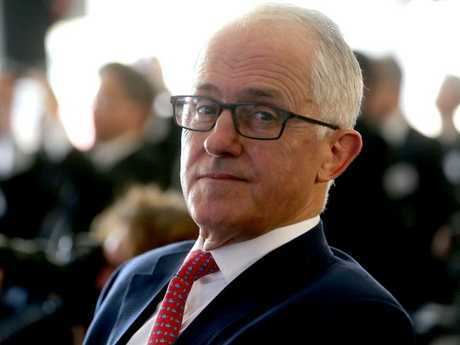 In a statement Prime Minister Malcolm Turnbull, Foreign Minister Julie Bishop and Defence Minister Marise Payne said the strikes were a "proportionate and targeted response". "They send an unequivocal message to the Assad regime and its backers, Russia and Iran, that the use of chemical weapons will not be tolerated," the statement said. "The use of chemical weapons by anyone, anywhere, under any circumstances is illegal and utterly reprehensible." "The Assad regime must not be allowed to commit such crimes with impunity." Senator Payne was briefed by US Secretary of Defence, James Mattis before the missile strikes on the three Syrian targets - a scientific facility near Damascus and two storage facilities near Homs. She said there had been "no Australian involvement" nor had there been any request for Australia to join the strikes. The British Prime Minister Theresa May also spoke with Mr Turnbull yesterday to discuss the strikes, and he commended the UK for taking part. 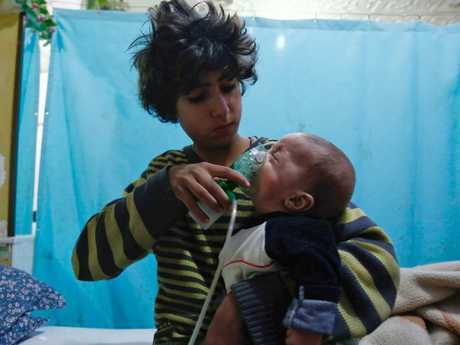 Australia's former ambassador to Syria, Bob Bowker said the US Government and its allies could not ignore the use of chemical weapons by the Syrian regime. "This action by Washington has probably made it more difficult for Syria to act unilaterally and the likelihood is, the Russians will advise them firmly against challenging the Americans," he told The Sunday Telegraph. "The Russians will be aware that if those strike were repeated and repeated again, Russian assets might be hit ... which would require a Russia response." "It sends a strong signal to the Russians to avoid escalation". Mr Bowker, who served as Ambassador to Syria from 2005 to 2008, said "carefully limiting" the strikes to chemical weapons targets demonstrated a high level of resolve and shouldn't escalate the situation. "Australia's interest in all of this is to avoid a situation where the Americans feel they need to do more," he said. "No one wants this situation to spiral." But Senator Jim Molan, a former major-general in the Australian Army, said it would be "really significant" if Russia doesn't act. "You have got to be very, very careful when you are sending a message through the use of military force," he told Sky. "It defines Russia who are trying to push themselves up in superpower status." Yesterday, Labor was briefed by the Government and offered bipartisan support for the "appropriate and targeted response". But the Greens said it had "grave concerns" about the strikes and called on Australia to rethink its alliance with the US, branding Donald Trump "an unpredictable and dangerous ally". 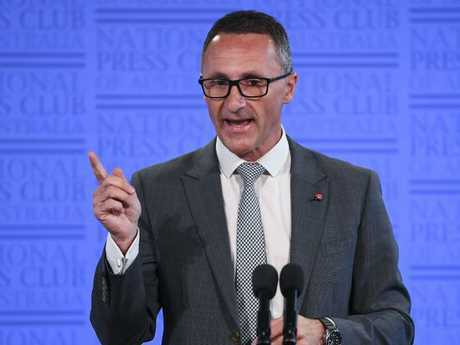 "The violence and suffering in Syria is appalling, and the use of chemical weapons is an abomination," Greens leader Richard Di Natale said. "But we don't need a barrage of missiles. This action risks dangerous escalation in a very complex and volatile war." Meanwhile, the air strikes plunged relations with Russia, the chief backer of Syrian leader Bashar al-Assad's regime, to a new low. Russian President Vladimir Putin last night said Washington had launched "an aggression against a sovereign state which is at the forefront of the fight against terrorism." He said Russia would call for an emergency meeting of UN Security Council, arguing the strikes would have "a devastating impact on the whole system of international relations." There were unverified reports emerging last night that four civilians may have been killed. The Al-Sura news agency said the deaths occurred after residential buildings were hit near the Barzah Scientific Research Facility in the capital Damascus, but the claim could not be confirmed. The Russian military also claimed the Syrian military - which it arms and advises - had shot down 71 of the 103 missiles fired. The claims, which were not confirmed by any of the allied countries, were made by Colonel-General Sergei Rudskoi, who said the strikes had not led to any casualties and caused only minor damage to Syrian military facilities. Col-Gen Rudskoi said Syria was in possession of Russian-made antimissile and defence systems which included Buk missiles - such as the one that brought down the civilian aircraft MH17 - and the Cold War-era S-200 systems. 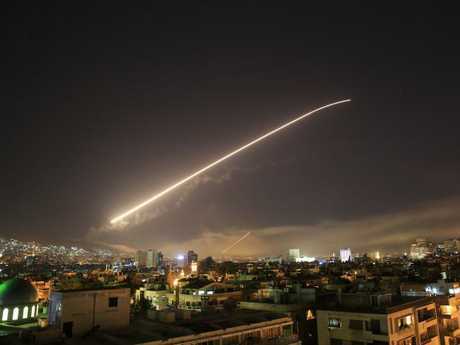 He also claimed the Syrians had successfully used Russian-made defence systems to shoot down all of the missiles aimed at four Syrian air bases. Earlier, Russian Ambassador to the US Anatoly Antonov warned of pay back. 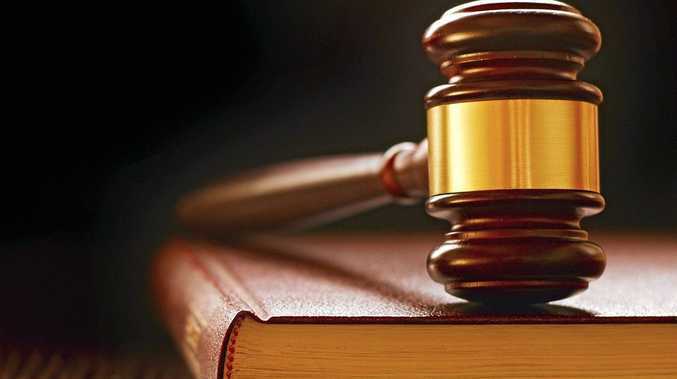 "We warned that such actions will not be left without consequences," he said. "All responsibility for them rests with Washington, London and Paris." US President Donald Trump said the broadside was necessary to stop dictator Bashar al-Assad's "evil" and "despicable" attacks on his own people with chemical weapons, which are prohibited under international law. He announced the strikes as they occurred, at 11am AEST, and said they were in direct response to a gas attack in the rebel town of Douma last weekend that killed at least 43 people. "This massacre was a significant escalation in a pattern of chemical weapons use by the very terrible regime," Mr Trump said in the White House Diplomatic Room. "The evil and despicable attack left mothers and fathers, infants and children thrashing in pain and gasping for air. "These are not the actions of a man. They are crimes of a monster, instead." The allied strike lasted just under an hour and carried more than double the firepower of a retaliatory attack launched by the US last year on a Syrian air base, after the chemical weapons massacre of dozens of civilians in the town of Khan Sheikhoun. It involved Navy and Airforce assets from the three countries. 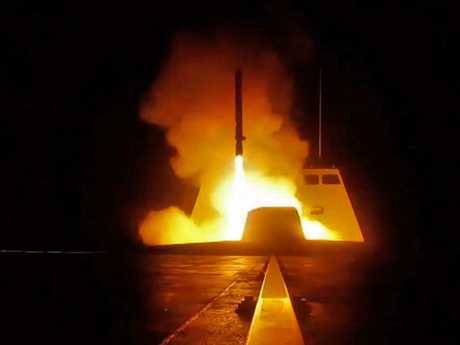 Syrian forces attempted to intercept the attack, with state television claiming 13 allied missiles were shot down. This figure was not confirmed by the Pentagon, although General Joseph Dunford, the Chairman of the Joint Chiefs of Staff, said there was "some initial surface to air missile activity from the Syrian regime". The Russians later revised that figure up to 71. The strikes targeted three chemical weapons facilities where weapons were developed and stored. Gen Dunford said the US had not given advance notice to Moscow about the attacks. "We specifically identified these targets to mitigate the risk of Russian forces being involved," Gen Dunford said. "We do not do any co-ordination with the Russians on the strikes and nor did we pre-notify them." 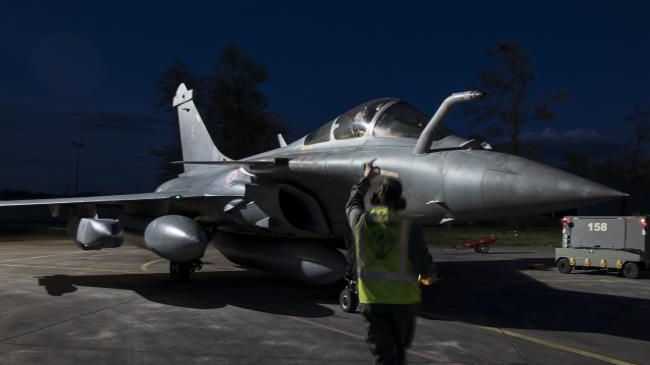 France last night contradicted that, saying Russia was given advance warning of the impending strikes by France and its allies. According to Reuters, Defence Minister Florence Parly told a press conference: "We are not looking for confrontation and refuse any logic of escalation, that is the reason why we, with our allies, ensured the Russians were warned beforehand." "This military facility was a Syrian centre for the research, development production and testing of chemical and biological warfare and technology," he said. "The second target was a chemical weapons storage facility west of Homs. We assessed that this was the primary location of Syrian sarin and precursor production equipment." Nearby was the third target, which "contained both a chemical weapons storage facility and an important command post". President Trump laid the blame for Syria's continued use of chemical weapons at the door of its two closest allies, Russia and Iran, "the two governments most responsible for supporting, equipping, and financing the criminal Assad regime". "To Iran, and to Russia, I ask: What kind of a nation wants to be associated with the mass murder of innocent men, women, and children? He said that despite a promise five years ago from Vladimir Putin that he would guarantee the elimination of Assad's chemical weapons capabilities, this had not happened. "Assad's recent attack - and today's response - are the direct result of Russia's failure to keep that promise," Mr Trump said. "Russia must decide if it will continue down this dark path, or if it will join with civilised nations as a force for stability and peace. Hopefully, someday we'll get along with Russia, and maybe even Iran - but maybe not." The personal attack on Mr Putin drew condemnation from the Kremlin, who said in a statement: "Insulting the President of Russia is unacceptable and inadmissable". Iran condemned the attack through local media and warned that the US and its allies would "assume the responsibility for the regional and trans-regional consequences of this adventurism". 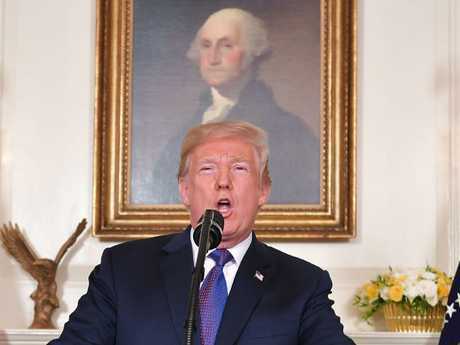 While Mr Trump has spoken as recently as the past week about his desire to pull US troops out of Syria, he promised America and its allies would continue to use "all instruments of our national power - military, economic, and diplomatic" to stamp out the regime's use of poisons. Describing it as a "hard strike", Defence Secretary James Mattis said the allies used "a little over double" the 59 Tomahawk cruise missiles launched last year. Mr Trump said last year's strike destroyed 20 per cent of the Syrian air force, but the airfield it hit was operating again within days. 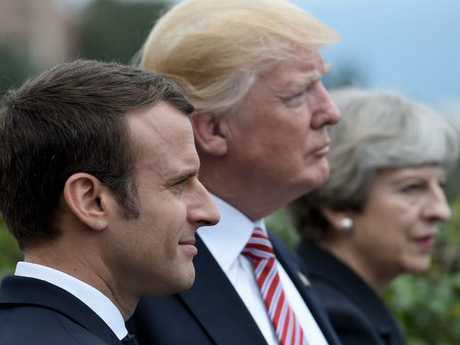 French President Emmanuel Macron and British Prime Minister Theresa May joined Mr Trump in framing the strikes as solely focused on chemical weapons eradication, rather than trying to gain a foothold in the seven-year-old Syrian war. "This is not about intervening in a civil war. It is not about regime change," said Mrs May. "It is about a limited and targeted strike that does not further escalate tensions in the region and that does everything possible to prevent civilian casualties. And while this action is specifically about deterring the Syrian regime, it will also send a clear signal to anyone else who believes they can use chemical weapons with impunity." A spokesman for the regional alliance that backs the Syrian government claimed the targets had been evacuated in advance after a warning from Russia. "We have absorbed the strike," the official told Reuters. "We had an early warning of the strike from the Russians ... and all military bases were evacuated a few days ago." European and Middle Eastern leaders have lined up in support of the strike, as UK Prime Minister Theresa May indicated those considering using chemical weapons should consider themselves warned. Germany, the European Council, Turkey and Israel spoke out in support of the "necessary'' and "appropriate'' military responses launched by the UK, the US and France on three Syrian targets. Mrs May gave a press conference at 10 Downing Street where she said the strikes were legal, appropriate, and in the British national interest. She linked the poisoning of Russian spy Sergei Skripal and his daughter Yulia in the UK last month to the strikes, saying the use of chemical weapons would not be tolerated by the international community. The UK has previously blamed Russia for the attack on the Skripals. Russia has denied involvement. Mrs May also cited some of the evidence the UK, US and France used when deciding to strike Syria, including eyewitness reports of a regime helicopter above Douma on Saturday, April 7, and the discovery of a barrel-bomb. Mrs May said the opposition forces in Douma did not operate helicopters or use barrel-bombs, and terrorist organisation Daesh did not even have a presence there. Mrs May defended her decision to use "prerogative powers'' to authorise the UK air strikes without taking it to Parliament and said she would be in the House of Commons on Monday for the issue to be debated. As Europe woke to the news, political leaders spoke out in support of the strike. In Turkey, the Foreign Ministry supported the military response. "The strikes launched by US, UK, France against Assad regime were an appropriate reaction, Turkish foreign ministry said on Saturday after an overnight attack on the Assad regime,'' a Foreign Ministry statement provided to the Daily Sabah newspaper said. "Last year, President Trump made it clear that using chemical weapons crossed a red line. Tonight, led by the Americans, the US, France and Britain acted appropriately," a statement attributed to an unnamed official in Jerusalem and distributed to the media read. "Syria continues to carry out murderous actions and to be a base for these and other actions, including by Iran, that puts its territory, forces and leadership in danger," the statement continued. The Times of Israel said "sources'' had confirmed Israel had advanced notice of the strikes. 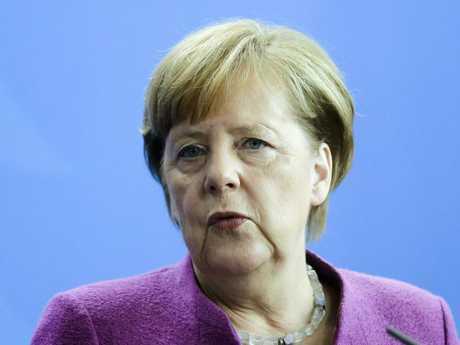 German Chancellor Angela Merkel backed the "necessary and appropriate'' military intervention. But closer to home for Mrs May, Labour leader Jeremy Corbyn questioned the legality of the strike and said Mrs May should have taken it to Parliament for approval, not "trailed after Donald Trump". A small anti-war protest was held in London on Saturday night, before the strikes were carried out, attended by several dozen people.